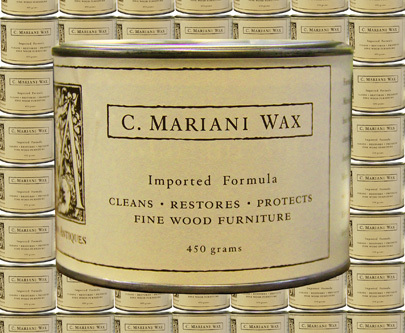 Formulated in Italy to the highest quality standards, C. Mariani wax has been used for three generations of European antique collectors and dealers. Utilizing a pure beeswax base and other natural ingredients, a small amount applied with a soft cloth cleans, restores, and protects the finest wood furniture and antiques. Available in either tinted (for darker antiques) or colorless formulae in 450 gram tins. Price $85 USD plus shipping and handling.